Within a few months of its establishment in early 1882, the Central Labor Union of New York and Vicinity (CLU), having acquired 50 federated organizations and 50,000 affiliated members, felt confident to take the step that would put it, and its organizers, into the history books. In September 1882, it held a ‘Massive Festival, Parade and Pic-Nic’ in Manhattan. 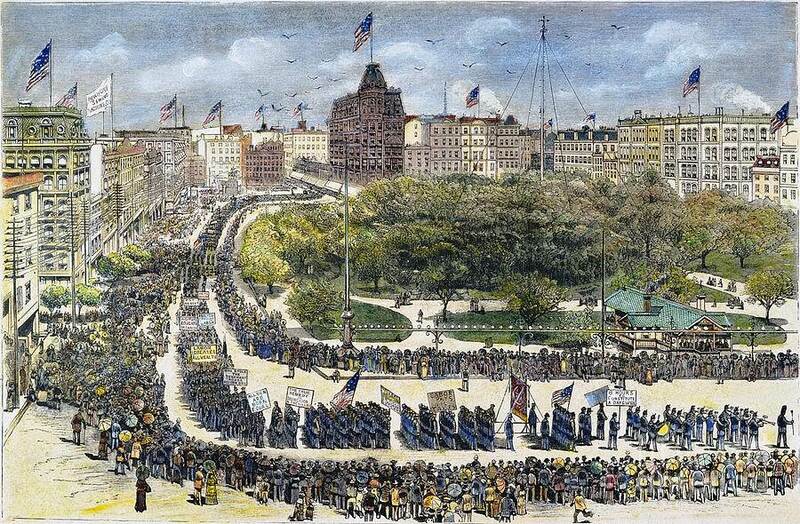 First Labor Day Parade: September 5th, 1882. The procession involved over 20,000 people marching, with banners, through the streets of New York City, with a subsequent picnic and rally late into the evening. The Brooklyn Advance Labor Club, the pseudonym for the Knights of Labor’s Brooklyn-based LA 1562, had played an important role in the organization of the event, and in the parade carried banners proclaiming ‘Pay No Rent’ and ‘Organize and Spread the Light’. Subsequently this event came to be seen as the first Labor Day parade, an institution that was to become a statutory national holiday in 1894. The argument about who is the ‘father’ of Labor Day has been an academic amuse bouche for many years. Traditionally it has been a battle fought on behalf of either P. J. Maguire, founder of the Carpenter’s Union and a leading figure in the later American Federation of Labor, or Matthew Maguire, the ubiquitous organizer of many of New York’s labor and socialist organizations during the 1880s. The latter has emerged in recent years as the apparent victor of this battle. Traditionally the motives for the original parade have been thought to range from the tactical wish of militant radicals to present a display of strength before Knights of Labor delegates who were to meet in Convention in the city that day, through to those who either wished to demonstrate in practical terms the power of the labor movement, or provide an inspiration for improving the lot of their fellow workers. In the battle between McGuire and Maguire, writers such as Grossman have attempted to draw a broader picture, seeing the establishment of labor day as something that the labor movement as a whole should take credit for, even if specific individuals such as Maguire and McGuire deserve particular credit. An alternative would be to look at what prompted the event, and a favorite source was the battle within the Knights at the time, most notably between the Brooklyn radicals and the leadership. However, the fatherhood debate trundles on, fuelled over the last century subsequent union and socialist politics. From the early twentieth century, Peter McGuire was promoted by the American Federation of Labor, and the union movement more generally, while for a long time Maguire’s contribution was minimized by both trade unionists and the state because of his ongoing and overt (and overly) socialistic leanings through to the end of the century (during which period he was elected as a Socialist Assemblyman and stood for Vice President as a socialist). In practice, the debate is not particularly helpful. The CLU had emerged very quickly and its early months had demonstrated its ability to bring together very large crowds into the halls and onto the streets on a variety of issues. It was almost inevitable that by September – the height of the season in New York for political organizations to have parades and picnics – it would wish to demonstrate its success as an emergent organization. It was also committed to involving itself in the forthcoming congressional and state elections, and this was a chance to put its concerns and issues out in front of both its members and the general public. No doubt, individuals had particular agendas, and the Knights – themselves on the path of rapid growth – would have wished to be involved in such an exercise, either individually or collectively, but they were still near enough to their days of secrecy not to wish to publicly lead it. The most likely explanation lies in an understanding of how the network of radicals in New York – with their multiple, overlapping and intertwining membership of a range of organizations – worked. In particular the primary agitators used the different organizations they joined (and usually ran) in different ways. The CLU was the one organizattion able to mobilize large numbers, apparently unified, and embracing the full range of radical labor issues. As a result the decision to have the parade was most likely made during informal conversations of the networks members at one or more meetings of the Brooklyn-based group of agitators, in the rooms at 365 Fulton Street that had in the previous eighteen months been the Spread the Light Hall. Here, where the now defunct Spread the Light Club had been set up, radicals from all of the relevant organizations met, under various banners – Greenbackers, unionism, the CLU and the Knights, Socialists. The one organization that could effectively lead up such a massive parade was the CLU and it was under their banner that the parade went ahead. Maguire, as Secretary of most of these organizations, including the CLU, was bound to be a central figure, and he would have drawn in network members as needed. But it required the resources of the CLU in terms of people and money to make it successful. The usual suspects for the tile of ‘father’ – to which should be added Robert Blissert and Theodore Cuno – each took on a different role: McGuire (not yet a CLU delegate) as a front man on the platform; Cuno as the ideologue; Maguire as the organizer; Blissert as the organization’s public figurehead. The success of the parade was based on the decision of this group, the work of them and many others. The success they achieved was then grasped by many so that the exercise was repeated though it was McGuire who first promoted the idea from the platform that it should be an annual event for labor. This entry was posted in Events, Media, Organisations, People and tagged Advance Labour Club, Agitate Educate Organise, Banners, Central Labor Union, Cuno, LA 1562, Matthew Maguire, Organise and Spread the Light, Pay No Rent, Peter J McGuire. Bookmark the permalink.